Instructor User Guide MessagesHow do I create a Messages folder? Folders can be created within the Messages tool to aid in organization. Select the New Folder button. Enter a title into the Folder Title field and select the Add button. 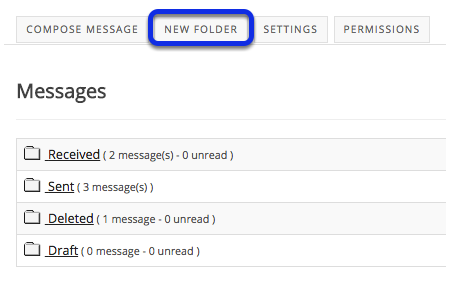 View the new folder in your list of message folders. The new folder will appear at the bottom of your list of message folders. Prev: How do I reply to a message? Next: How do I move a message?